Good mental health is about managing a range of emotions, both positive and negative, living a meaningful life alongside your values and things that are important to you. Protective factors (things that help keep us safe) include family and friends and personal characteristics such as resilience that help you deal with stressful events . Mental health is influenced by genetics, our social environment and the way our minds make sense of the world. illness has an impact on the way you think, how you feel and what you do. Mental illness can affect you physically, psychologically and socially. Life events, such as traumatic experiences and physical health issues can impact on your well-being. Psychological distress may result in a loss of connectedness with yourself and the world around you. Mental health problems are very common, affecting around one in four people in the UK. Anyone, regardless of ethnicity, culture, religion or location in the world can become mentally unwell. However, due to the stigma associated with it not everyone feels able to seek help and support. Diagnoses and labels such as depression, schizophrenia, obsessive compulsive disorder etc. are the most usual way of dividing and classifying symptoms and are given to help healthcare professionals refer you to the appropriate services. Although certain symptoms are common no two people behave in the same way when they are mentally unwell. How do I know that I have become mentally unwell? You may find it more difficult to adjust to certain life experiences or feel low in mood with no clear reason. Others may hear voices or see things that other people do not. You may begin to notice that you are becoming more socially withdrawn, you are not functioning as you normally do at work or at home, problems with memory or concentration, difficulty sleeping or changes in appetite may also be experienced. The impact of mental health can be wide ranging depending on your diagnosis. Many people live with a mental health problem without knowing what it is because they do not have enough information about what support is available to them. Do I need to take medication if I am mentally unwell? Mental illness is often treated by a variety of health care professionals including GPs, psychiatrists, community psychiatric nurses and clinical psychologists. Being fully informed about what services and help is available is important however please remember that medication is not the only treatment you can get. Medication does not suit everyone’s needs however can be helpful to stabilise your mental health. The National Institute of Clinical Excellence (NICE) part of the Department of Health recommends a combination of medical and psychological treatment for several mental health difficulties. Psychological treatment may include one to one therapy with a qualified therapist or even group therapy with others who are going through similar. Psychological therapy aims to help you make sense of difficult experiences and to develop an understanding and acceptance of issues that you may be facing. It is only when we are open to your experiences and aware of our thinking and behaviour patterns can we commit to more helpful behaviours. Therapy may also involve the development of more helpful coping strategies, with self-compassion at the core of this. Remember, you are the expert of yourself here. There is also a range of self-help material to read at home to try and help yourself (please see the signposting section). Recovery is a journey and most people learn to manage or live with their difficulties especially if they receive support as early as possible. During this time it is important to remember your strengths and achievements. Being mentally unwell does not represent the whole of who you are. Making sense of your experiences and thinking about what gives your life purpose is necessary. Promoting healthy living and knowing where to go or who to ask for help, should you require it is encouraged. Acknowledging the difficulties or change in how you are feeling or thinking is often the first step. You can help yourself by talking to people close to you whom you trust about how you feel, exercising regularly, eating healthily and asking for help or more support when you need it. It is also important to find things that you enjoy doing or engaging with. Your religion may aid your coping further. 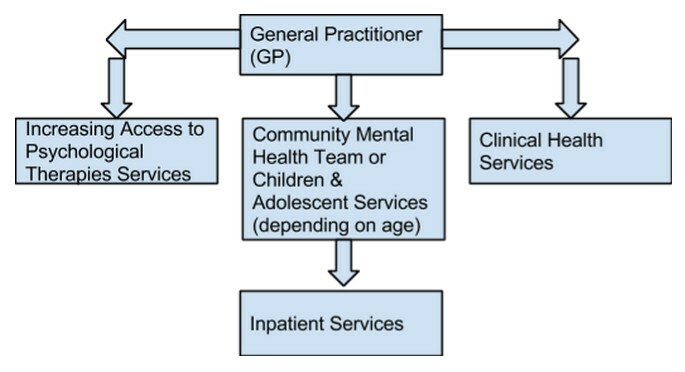 The diagram below represents the services the NHS provides to serve your mental health needs. When you visit the GP, they can refer you to an Increasing Access to Psychological Therapies (IAPT) service if your mental health condition has a mild/moderate impact on your life. If your mental health is complex, severe and enduring you will be referred to the Community Mental Health Team (if you are over 16 years old). If you are under 16 you will be referred to CAMHS (children and adults mental health service). People are referred to the Memory Assessment Services when a diagnosis of dementia is suspected. Clinical health psychology services are also available for individuals who need further support adjusting to a physical health illness (e.g. stroke, heart attacks, diabetes, cancer) and often these referrals come from hospital Consultants or GPs. Should you require more intensive support inpatient admission into a hospital may be required. Each one of these services offers a range of treatments from medication to talking therapies to help support you and/or your family.